In 1966 the band moved to Bakers Hill H.Q. of the Brixham Branch of the British Legion. The premises were much more comfortable than the old ice factory. 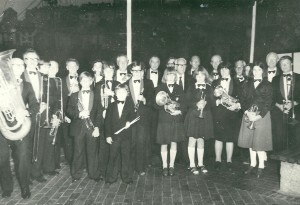 That year the band advertised for more cornet players as we were getting rather short in number. Cornetists are a problem for most bands and they are a most important section of any band. It was about 1969 that we decided on a new style of uniforms. We changed from button up to the neck Royal Marine style tunics to a more casual Blazer style with the Legion Badge and maroon ties. At the AGM of 1969 our long serving secretary retired. Bill Kikkie had given 23 years of loyal service to the band, he was a window cleaner in the town and was a founder member at the start in 1946. During 1970 the band entered the South West Bras Band Association Contest at Paignton and won fourth prize in the third section. In 1971 Mr Arty Braund decided to retire. He had played in the band before the War. His instrument was the Eb Bass. Another ex Royal Marine bands man joined in 1971 and he was Mr Lionel Tatton who was very welcome. lt was also about this time that a few Woodwind players joined us and as we were short in the Cornet section the Clarinets were very useful. 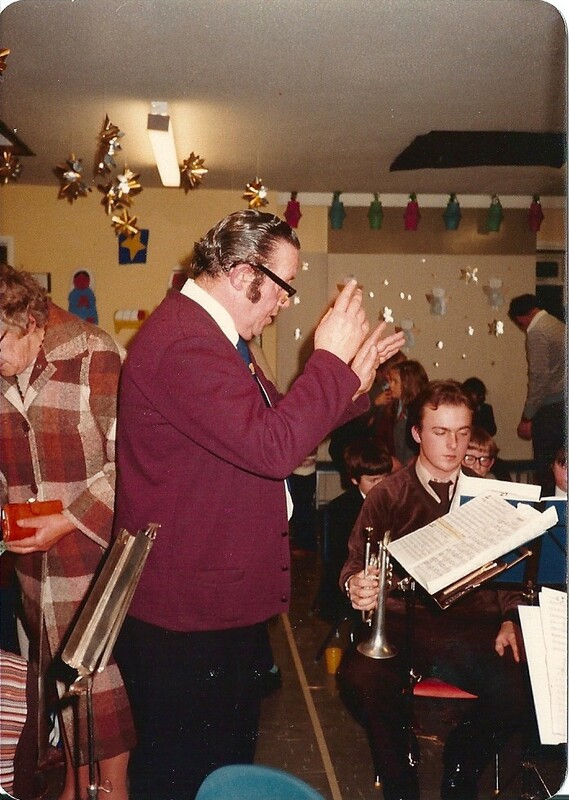 Duggie Hutchings stood down from Bandmaster to play principal cornet and Mr Tatton took over the Baton. In 1972 Mr Sam Little was appointed Hon, Secretary and later proved to be a big asset to the band. Sam and Ted Thomas a long standing member. decided to start a youth band and with a few senior members it became a success. Many young members were trained and went on to join the Senior band which was the whole idea. Without these young players the band would not be so successful today. Several of the youth band went on to join the Forces as Bands men. One of these members was Robert Thomas who joined the band as a seven year old in 1964 and went on to join the Band of the Light Dragoons. He was made redundant from the Army a few years ago after 19 years as a musician. At this time he was our principal cornet and Deputy Musical Director of our band. He in turn, is now training the Youth Section. Also in 1972 the band decided that the title of Musical director be implemented and that position would be given to Duggie Hutchings. The Bandmaster title would still be kept by Lionel Tatton. During the Summer of 1973 the band gained another important member who had just retired as a Military Bandmaster. This was a Mr John Pope, a Brixham man with ARCM qualifications. Mr John Pope took over as Musical Director of the Senior and Youth Bands and we became very busy, playing at school fetes and concerts, as well as our Summer engagements on the Quay side. The band have played under the old fish market since 1947 during the summer months. Without the collections from these concerts the band could not have survived financially. A band of about 30 instruments must be kept in good repair and this costs a lot of money. We just cannot afford to buy many new instruments so the next best thing is to purchase good second hand ones, and these also have to be insured. New music has to be bought each year to try and keep up with the times. The Brixham Royal British Legion Band received no help at this time from the Torbay Borough Council although we play at least 25 concerts at the Quay side every year. We even have to pay our own car parking expenses whilst playing on the Quay. We pride ourselves on providing free entertainment for local people and visitors on the Quay side on Mondays and Thursdays throughout the summer season. Our volunteer collectors are always on hand if you wish to help out the band funds! These collections are our bread and butter. Almost since the restart of the band in 1946 our president had been Mr George Braddick, he was a town councillor and was also the Chairman of the Brixham branch of the now Royal British Legion for many years. This year (1973) he resigned as President and became patron of the band. Mr Alf Vincent had now become our President and he and his wife Joyce helped us in many ways.